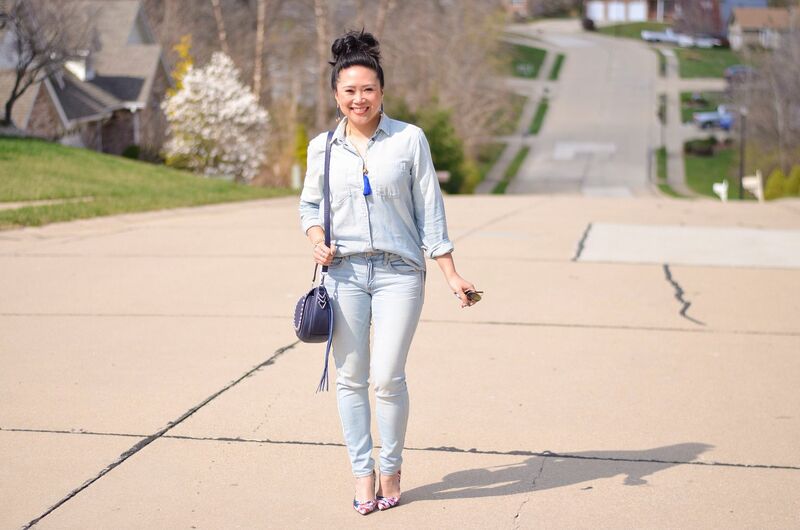 I swear denim on denim just *feels* better when I'm wearing a pair of my "Licorice" style pumps by Kate Spade. (I've done this before here.) Thanks to an awesome sale price, I was able to snag them in glitter over the weekend. 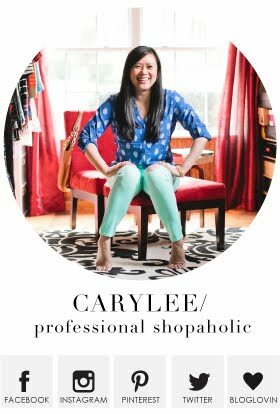 It's no secret that I have a TON of shoes, specifically heels, and this style is my favorite. I could own a pair in every color if I could! What do I like about them? They're the perfect shape, the perfect pointed toe, and they're awesome quality. They're as comfortable as 4" heels can be, and the fact that I have soon-to-be five pairs should speak to this fact. My closet room real estate is too valuable to waste space on uncomfy shoes! Kinda obsessed with my new phone case! 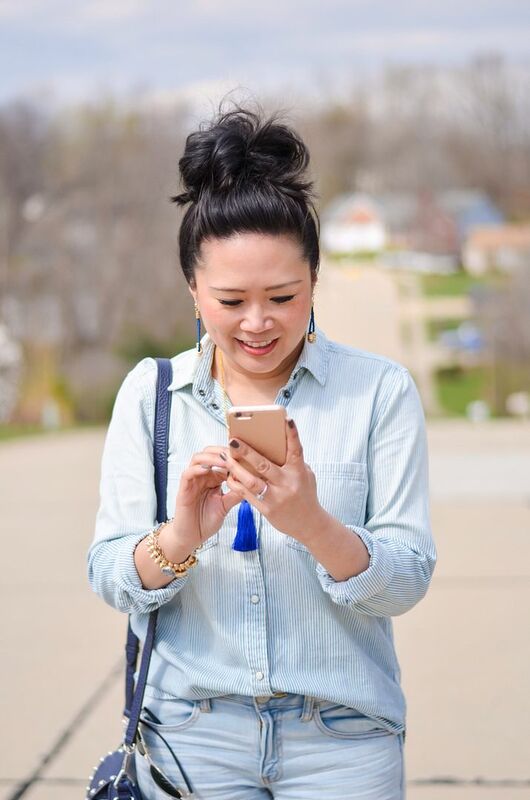 Whenever the husband wants to go to Best Buy, I perk up because that means outfit shopping for my phone! Ha! They have the best selection of Kate Spade cases, and even though I've tried to venture out and try other cases, I always come back to hers. The designs are clever and they don't make my phone unnecessarily bulky. I loved that this one was rose gold to match my phone. And let's talk about this bag for a second. 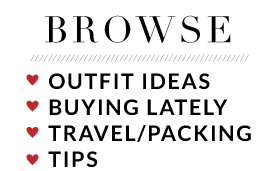 I was stalking it during Shopbop's big sale earlier this month, but I decided to just hold off. I loved the navy color - I've been needing a navy bag. (Really, I did!) Well, I decided to hold off, and wouldn't you know, within 48 hours, Nordstrom had it on sale for 40% off! Luckily Jenna knows about all of my shopping needs, so she notified me the second she saw it! I ordered it before my work laptop even had a chance to boot up at work! And I'm glad I did because it was long gone by the end of the workday. Floral can feel very 80s to me, and not in a good way. But I just love the primary colors of these heels and the fact that it's almost just a bit of a an abstract floral print. They're good, and I apologize in advance for wearing them on repeat and on repeat and on repeat. Have a great Tuesday Shoesday! Great look dear! Love your style! 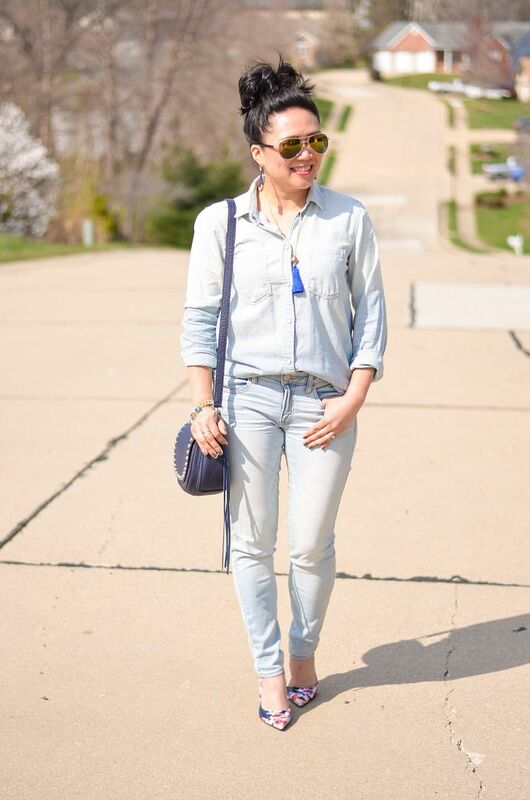 I love denim on denim and that bag really is a beauty. Super cute look! Love the heels and bag together. I tried the licorice pumps once, but found that they ran smaller than my usual go-to Karolina style from her. I really should try sizing up. They're beautiful, classic shoes! LOVE LOVE LOVE! 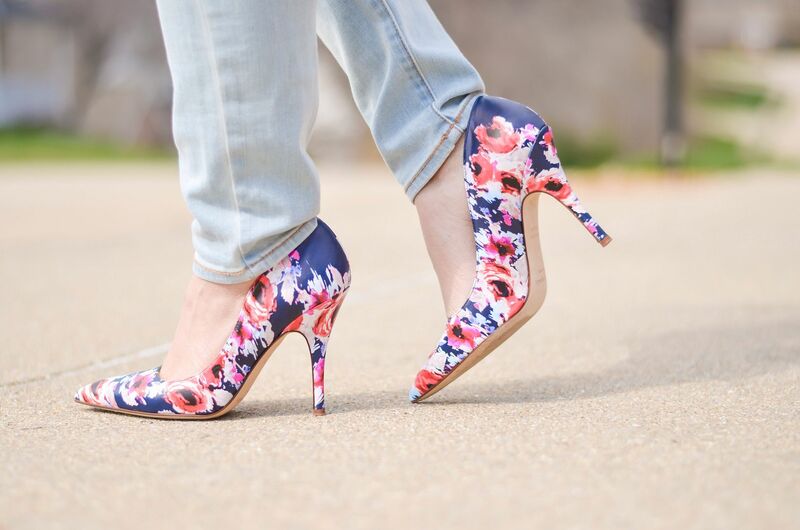 Those licorice pumps are so good and that floral print is perfect, plus you can never go with denim on denim! 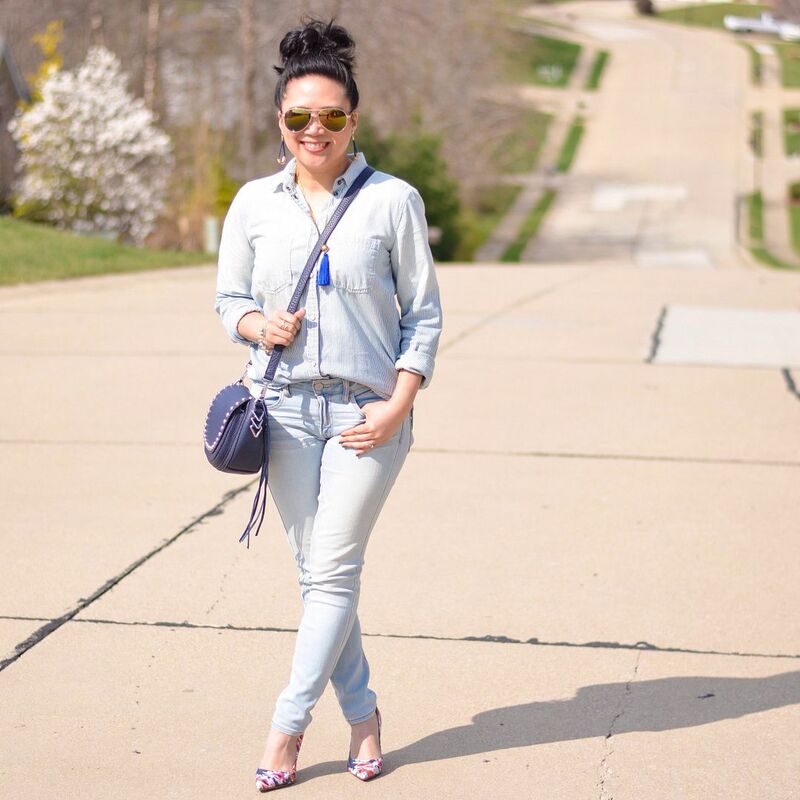 I love how this is a lighter version of an all denim look! So good! 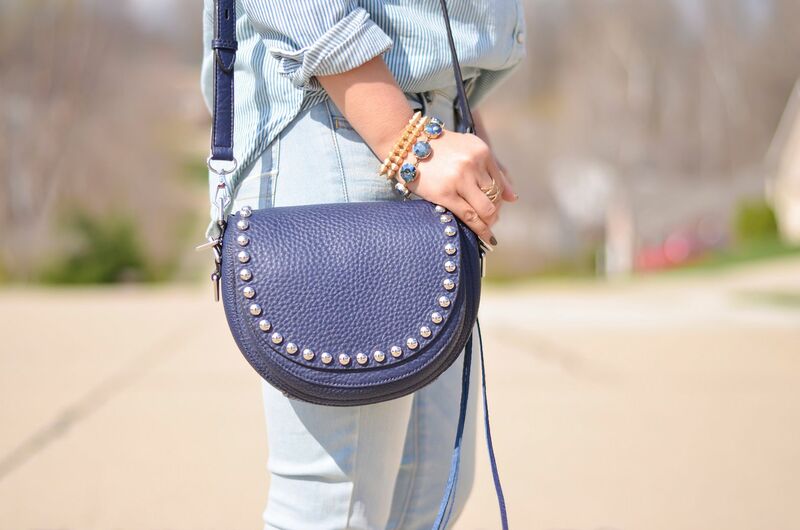 I love that navy handbag! very cute look!